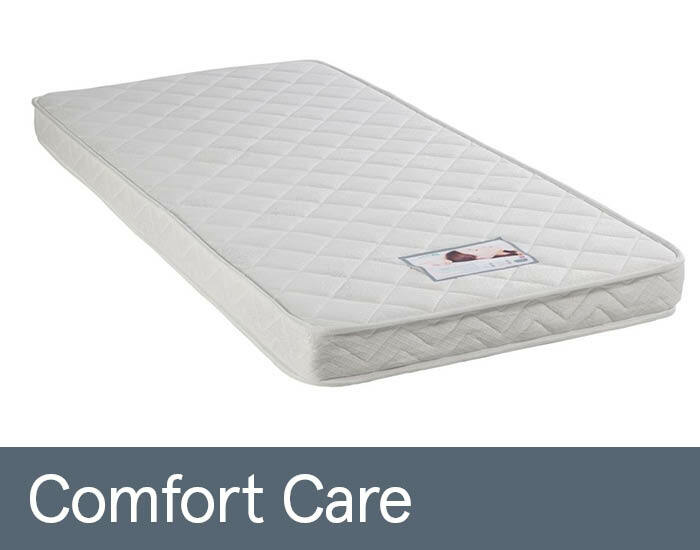 Comfort Care offers a great example of mattresses to help relieve the pressures and pains brought on through the night, through reflex foam and the soft upholstered quilted cover, designed to give the best nights sleep possible. As the mattress is vacuum packed it has a soft/medium feel due to the 115mm reflex foam creating a balance of comfort and support perfectly. Reflex foam allows the mattress to shift with where pressure is exerted to constantly align with the body's natural curves, before bouncing back into shape to give the best support possible. Regular rotation is advised to prolong the mattress' life span. Comfort care is available in sizes; single, small double and double, perfect for bedsteads or complementing a divan bed of your choice.